Samuel Kabue, PharmD, is a Post-Doctoral Research Fellow at the Kaiser Permanente Northern California Division of Research. Dr. Kabue is the inaugural Clinical Informatics Research Fellow embedded within the Delivery Science Fellowship training program. He received his undergraduate degree in Cell and Molecular Biology from the California State University East Bay and his Doctor of Pharmacy degree from the University of California San Francisco (UCSF). 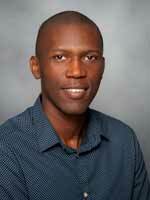 His previous research focused on the availability and affordability of medicines in Kenya. His current research focuses on improving the quality and value of pharmacy care delivery with the use of informatics and analytical approaches. He is interested in using electronic health record data to improve the prediction of medication-related outcomes. JAMA Pediatr. 2018 Aug 06.